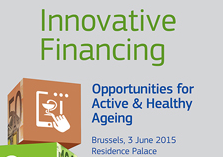 The European Commission, DG SANTE is organising the Conference ‘Innovative Financing Opportunities for Active & Healthy Ageing’ on the 3rd June 2015. The Conference will look at the issue of how to practically leverage public and private financial instruments and maximise synergies in the area of active & healthy ageing. 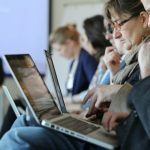 In particular, the Conference will focus on the EU financial instruments, Investment plan for the EU, joint-procurement of innovative solutions, and new ways of public-private co-investments in health. The Conference will feature speakers and panellists discussing the synergies in the European Structural and Investment Funds and Horizon 2020, public private partnerships, social innovation and alternative financing means. 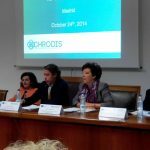 The European Commission’s Investment Plan for the EU seeks to encourage public and private investments in specific projects which will deliver in key areas such as knowledge, innovation and the digital economy; in this respect the Conference would discuss building up cases addressing innovation on active and healthy ageing in the project pipeline of the Investment Plan.